Im Kæfig der Freiheit. Wolfsburg, Germany: Kunstmuseum Wolfsburg, 2016, p. 15. Champion, Julie and Caroline Edde. Jeff Koons: La Retrospective: The Album of the Exhibition. Exh. cat., Belgium: Centre Pompidou, 2014, p. 25. Champion, Julie and Nicolas Liucci-Goutnikov. Jeff Koons: La Retrospective: The Portfolio of the Exhibition. France: Centre Pompidou, 2014, p. 77. Galerie Max Hetzler. Remember Everything – 40 Years Galerie Max Hetzler. Berlin: Galerie Max Hetzler, 2014, pp. 116, 275. Koons, Jeff and Norman Rosenthal. Jeff Koons: Conversations with Norman Rosenthal. China: Thames & Hudson, 2014, p. 139 [English Edition]. Koons, Jeff and Norman Rosenthal. Jeff Koons: Entretiens avec Norman Rosenthal. Hove, England: Thames & Hudson, 2014, p. 139 [French Edition]. Moderna Museet. Sculpture After Sculpture: Fritsch/Koons/Ray. Exh. cat., Ostfildern: Hatje Cantz, 2014 [Texts by Jack Bankowsky, Thomas E. Crow, Nicholas Cullinan, Made Great, conversation between Michael Fried, Isabelle Graw, Michelle Kuo, Charles Ray, Scott Rothkopf], p. 77 (installation view, Sonnabend Gallery, New York, 1988). Sterckx, Pierre. 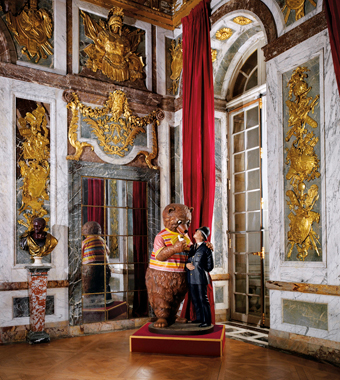 “Quand Jeff Koons euphorise l’art.” Beaux Arts editions December 2014, p. 47. Botta, Carlotta Loverni. "Koons at the Fondation Beyeler." Vogue Italia 15 June 2012. Cork, Richard. “Childish Things, The Fruitmarket Gallery, Edinburgh.” Financial Times 4 January 2011, illustrated in color. Ito, Toyoko. "Animal Arthouse." Vogue Hommes Japan (vol. 3) 2009-2010, p. 110, illustrated in color (installation view, Château de Versailles, Versailles, 2009). Sollins, Marybeth, ed. Art:21 – Art in the Twenty-First Century 5. New York: Art 21, Inc., 2009, p. 98, illustrated in color. Bader, Graham. "Jeff Koons: Museum of Contemporary Art, Chicago." Artforum September 2008, p. 449, illustrated in color (installation view, Museum of Contemporary Art Chicago, Chicago, 2008). Holzworth, Hans Werner, ed. Jeff Koons. Cologne 2008, pp. 299 (installation view, Galerie Max Hetzler, 1988), 304-305 (detail), 306, illustrated in color. Pincus-Witten, Robert. “Passages: The Eyes Had It.” ArtForum January 2008, p. 70, illustrated in color (installation view, Sonnabend Gallery, New York, 1988). Von Wagner, Thomas. "Generation Zeitgeist." Art-Das Kunstmagazin (no. 1) January 2008, p. 4 (installation view, Sonnabend Gallery, New York, 1988) and p. 40 (installation view, Sonnabend Gallery, New York, 1988). Camhi, Leslie. “The Seer - Ileana Sonnabend” New York Times Style Magazine 2 December 2007, pp. 47, 206-209, 234, illustrated. Seymour, Stephanie. “Jeff Koons: Art Made in Heaven.” Whitewall Fall 2007 (issue 7) p. 140, illustrated in color. Swenson, Kristen. “Louise Lawler Looks Back.” Art in America December 2006, p. 119, Louise Lawler, "Between Reagan and Bush," 1989 (installation of Banality photographed by Lawler). Von Hans-Joachim, Müller. “Wir sind Oberammergau.” Monopol (no. 6) December 2006, p. 45, illustrated. Jeff Koons: Highlights of Twenty-Five Years. Exh. cat., New York: C&M Arts, 2004, p. 17, 88 (detail). Woltmann, Marit, ed. 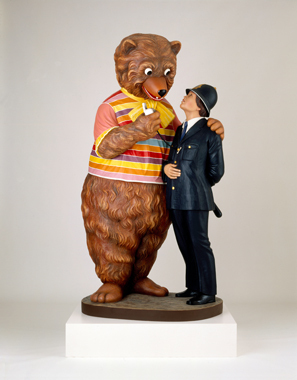 Jeff Koons: Retrospektiv. Exh. cat., Oslo: Astrup Fearnley Museet for Moderne Kunst, 2004, p. 88. Joachimides, Christos M. and Norman Rosenthal, eds. The Age of Modernism: Art in the 20th Century. Berlin: Hatje, 1997, illustrated in color, cat. 334. Zaunschirm, Thomas. Kunst als Sudenfall: Die Tabuverletzungen des Jeff Koons. Freiburg, Germany: Rombach Verlog, 1996, p. 52. The 20th Century Art Book. London, 1996, p. 249, illustrated. From Beyond the Pale: Art and Artists at the Edge of Consensus. Exh. cat., Dublin: Irish Museum of Modern Art, 1994, p. 35, illustrated. Collection pour une region: Richard Baquie, Jedermann N.A., Jeff Koons, Rombouts & Droste, Haim Steinbach. Exh. cat., Bordeaux, CAPC Musee d’Art Contemporain, 1993, p. 35, illustrated. Littlejohn, David. “Who is Jeff Koons and Why Are People Saying Such Terrible Things About Him?” Artnews April 1993, p. 92, illustrated. Sørensen, Jens Erik & Anders Kold, ed. Jeff Koons Retrospektiv. Exh. cat., Århus: Aarhus Kunstmuseum Denmark, 1993, p. 64. Jorg-Uwe, Albig. "Jeff Koons, ein Prophet der inneren Leere." Art-Das Kunstmagazin December 1992, p. 57, illustrated. Koons, Jeff. The Jeff Koons Handbook. London: Anthony d'Offay Gallery, 1992, p. 115, illustrated in color. Muthesius, Angelika, ed. Jeff Koons. Cologne, 1992, pp. 25 (installation view, Sonnabend Gallery, New York, 1988), pl. 22, pp. 120 (detail), 121 illustrated in color, (installation view, Galerie Max Hetzler, Cologne, 1988). Robert Gober, On Kawara, Mike Kelley, Martin Kippenberger, Jeff Koons, Albert Oehlen, Julian Schnabel, Cindy Sherman, Thomas Struth, Philip Taaffe, Christopher Wool. Exh. cat., Cologne: Galerie Max Hetzler, 1992, p. 31, illustrated. Selected Works from the Early Eighties: Jeff Koons, Barbara Kruger, Louise Lawler, Sherrie Levine, Allan McCollum, Richard Prince, Cindy Sherman, Laurie Simmons. Exh. cat., Munich: K-Raum Daxner, 1992. Farrow, Clare, Andreas Papadakis and Nicola Hadges. "Jeff Koons: The Power of Seduction." Art & Design 6 (no. 1-2) January–February 1990, pp. 48-53 [reprinted, New Art International, London: Academy Editions, 1991, pp. 153-157]. Museum of Modern Art. High & Low: Modern Art and Popular Culture. Exh. cat., New York: Museum of Modern Art, 1990, pp. 396-397, illustrated. Ammann, Jean-Christophe. “Der Fall Jeff Koons.” Parkett (no. 19) 1989, p. 54. "Collaborations, Martin Kippenberger-Jeff Koons." Parkett (no. 19) 1989, p. 35, illustrated (installation view). Edstrom, Peter, Helene Mohlin and Anna Palmqvist. What is Contemporary Art? Malmo: Rooseum, 1989, p. 103, illustrated. Kertess, Klaus. “Bad” Parkett (no. 19) 1989, p. 35, illustrated. Mit dem Fernrohr. Exh. cat., Kunsthaus Basel, January 1989, pl. 49, illustrated. Museum of Contemporary Art. A Forest of Signs: Art in the Crises of Representation. Exh. cat., Los Angeles: Museum of Contemporary Art, 1989, pp. 40, 172. “Atlantisches Bundnis, eine Gesprachsrundemit mit Georg Herold, Jeff Koons und Isabelle Graw.” Wolkenkratzer January–February 1988, pp. 36-42.